Bar Baar – meaning Again and Again - is the latest social hub and gastropub located at Majestic City Retreat Hotel in Mankhool Road, Bur Dubai. 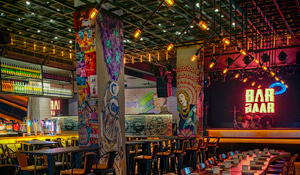 Recently nominated for the ‘Best Bar Food’ and ‘Best Live Music’ by Time out Dubai 2019, Bar Baar, which recently started the Gully Boy lunch, offers the best blend of the office and the café. Home to freelancers and creative souls looking for an exhilarating alternative to a typical work day. Bar Baar is an urban hangout that’s designed to take you offline while still keeping you connected; a place where networking can happen in a collaborative workspace, a hub for artists, designers, and innovators. It’s where entrepreneurs meet photographers, writers meet web developers, creative independents meet to bounce ideas off like-minded peers. It is well known for its live entertainment and various theme nights such ladies’ nights, happy hours and its 8 hour drinks deal offering beverages from just Dhs10 every Tuesday from 7pm to 3am as part of its Wholesale Night where customers can choose a wide selection from mixed drinks to house grape.